From Harper’s Weekly, 11 October 1862, p. 652. A copy of this image is in the Historic Shepherdstown archives. It can be found online at Internet Archive (https://archive.org/stream/harpersweeklyv6bonn#page/652/mode/2up : 2016). Lee and his army of Northern Virginia had just witnessed the most devastating and destructive fighting they had seen up this point in the war. 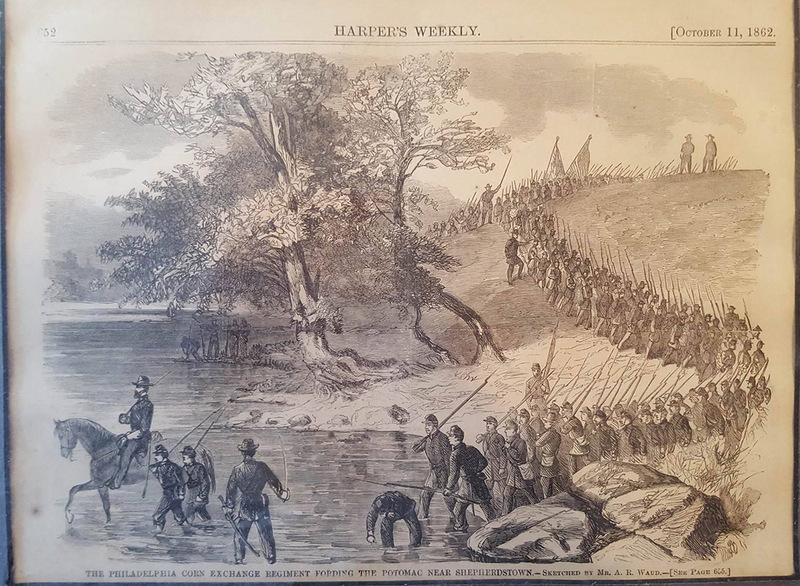 His battered and broken regiments crossed over the Potomac back into the safety of Virginia at Botelers ford. Once across the river in Shepherdstown Virginia, the confederates moved toward Martinsburg. The man left in charge of the rear guard was General Pendleton of the reserve artillery. Along with him for the rear guard were about 300 infantry volunteers. As soon as McClellan learned of the confederate withdraw from the banks of the Antietam Creek he ordered his cavalry under General Alfred Pleasanton to advance after the retreating confederates. He also sent orders to the V corps under John Fitz Porter to advance to the vicinity of Shepherdstown. After both the cavalry and the V corps arrived on the field, they had over 70 pieces of artillery firing on the confederates sitting on the bluffs above the river. Pendleton had to fight back only 44 pieces. The small band of confederates held off for the day but was in shambles from the Yankee bombardment of Shepherdstown. By nightfall, the confederates were pulling out of the area and the union troops were crossing back over to the Maryland side of the river. General Pendleton spent the night of the 19th in confusion of the situation at hand while he searched for help. He would receive help in the form of A.P. Hill and his Light Division. By morning of the next day, the confederates were back to reclaim the supposed loss of the entire artillery train. Also marching in that direction was parts of two divisions marching across the river to see what was on that side of the river. One part of the force was the U.S. regulars under General George Sykes. The other parts of the force crossing were volunteers, and a lot of those troops were green. The experience factor would show itself this day in history. The regulars pushed forward and found that a large confederate force lay in their front; they would pull out with little no difficulty. A green regiment of volunteers had a different story to tell. The 118th Pennsylvania volunteers, or the “Corn Exchange” regiment, ended up going against the battle hardened men of A.P. Hill’s division. The battle raged and out of the 737 fresh union troops going into the fight, 269 would become a statistic in the list of casualties. By nightfall of the 20th the confederates reclaim all but 4 artillery pieces that Pendleton claimed to loss and push the union advance back to the Maryland side of the Potomac, and ending the Maryland Campaign of 1862. Shepherdstown during this battle was a mass of wounded and dying confederate soldiers. Each home, out building, church, and public building had one purpose of use at this time, that of a hospital. Towns people were running around with anything they could use to help with the medical process, whether that was food, hay, banding, or just a hand to hold on to. The only building not touched by the blood stains and cries of men was the Trinity Episcopal Church at the corner of German and Church Streets. The battle at Shepherdstown only added to the amount of injured that the town’s people had to care for and feed. By September 24 the town was feeling the pressure of war wear off from the two armies putting distance between them. The pressure to care for the wounded continued however, and would continue well into the next year in 1863.